Perhaps the most important personal branding takes place on LinkedIn, social media for professionals, with our profile pictures playing a starring role. Communication today is multi-faceted. Whether you’re communicating for business or pleasure, in this class you’ll learn to navigate social media channels, select the “best fits” for you, and enjoy connecting with friends, colleagues, and/or customers. Includes how to set up a website or blog with WordPress, plus Facebook, Twitter, LinkedIn, Pinterest, Instagram, Flickr, and Snapfish for photo storage. Brush up on your skills by taking one class or both! Small businesses account for one of the fastest-growing segments of social media due to its free availability and effectiveness. Facebook 101 is a 2-hour workshop. Learn how to best utilize a media staple—Facebook—to showcase your arts/crafts or small business. The session will provide practical tips and helpful how-to’s, geared towards developing and maintaining a Facebook business page—often thought of as a mini-website. Time for personal Q&As is included during the class. Twitter 101 is the focus of the afternoon session, designed to help you develop a comfort level and strategies for tweeting like a pro! This session allows time for your personal Q&As. The Philadelphia Zoo is wild about Instagram! This column examines the latest social media trends, while highlighting Gettysburg and Adams County businesses.This article was first published in Celebrate Gettysburg magazine, May/June 2014. One of the fastest-growing forms of social media, Instagram features smartphone-based photography combined with a variety of fun apps that add vintage appeal. About 5 million mobile photographers are signing up weekly, and Instagrammers recently surpassed the 50 million mark. It’s a remarkable success story, as Instagram went from a zero-revenue startup to a $1 billion company that Facebook purchased in April 2012. Instagram’s visual appeal ties in perfectly with one of the biggest topics in social media circles: the growing prevalence of images and the decreasing amount of text, on both the Internet and social media channels. Whether you join Instagram purely for fun—sharing photos with family/friends—or whether you approach it from a business perspective, Instagram offers a unique blend of smartphone technology combined with a nostalgic twist. The app lets you select from a variety of 20 filters, many of which give your photos a retro feel. For example, there’s the “1977” filter with a Polaroid-type appearance. Basically, your “feed” consists of photos from people you follow, similar to other social media streams. The big difference is that Instagram is 100 percent eye candy—photographs with very little text except for short captions, which are optional. Like Twitter, hashtags help identify photos within a theme. Small businesses, associations and nonprofits are hopping on the Instagram train every day and adding it into their marketing campaigns. What a beautiful way to showcase a brand—snapping exclusive, behind-the-scenes photos or highlighting products or events in order to reach new audiences. Some of the most visual and creative Instagram images are posted by USA Today, Starbucks, National Geographic and the Philadelphia Zoo. If you enjoy Gettysburg area scenery and events, these are three accounts to watch! And to read more about the upward trend of visuals, see our previous article, The Visual Vocabulary of Social Media. Welcome to “Gettysburg Social!” This column examines the latest social media trends and was first published in Celebrate Gettysburg magazine, March/April 2014. Ninety-five percent of American teens have access to the Internet and 78 percent own a cell phone—two reasons that social media use continues to soar among teenagers. According to the Pew Research Center, 81 percent of online teens use social media. What can adults do to help teens stay safe and maintain a healthy perspective? Facebook, Twitter and Instagram are the top three social media sites used by teens. All three require users to be at least 13 years old. Sixty percent of teens use privacy settings on Facebook, meaning only friends can see their posts and photos. That means 40 percent grant public access to their photos and information. Ninety-two percent use their real names on the profiles they use most often; 91 percent post photos of themselves. Social media can be accessed on cell phones, computers, iPods and other devices. Set usage limits and make sure teens maintain a balance of “real life,” studying, sports/activities, family time and socializing with friends vs. “screen time.” This may not win you a “mother-of-the-year” award! Talk to teens about boundaries, privacy and safety. Topics for discussion include location-enabled services, privacy settings, appropriate language and examples of cyberbullying. Social media use can impact future college and job applications. Help teens understand that their actions, online or otherwise, have consequences that reach beyond their teenage years. One last statistic: 72 percent of parents say they do not get involved in their teens’ social media use because they are “overwhelmed by technology,” and they just hope for the best. To see previous Gettysburg Social columns, click here. Karen Hendricks, the mother of three teens, owns Hendricks Communications, a Gettysburg-based firm specializing in PR, marketing and related services such as social media. She also teaches social media classes regularly at the Adams County Arts Council. One of the prominent themes woven into last week’s Social Media Week NYC was the increasingly growing use of photos on all forms of social media. Images now comprise 40% of the internet and 70% of all social media channels. Wow. In our lightning-fast-paced society, people process images 60,000 times faster than text. During a recent survey, two out of three people said images are more powerful than text. Six in ten people report they are taking more photos than ever before, thanks in great part to cell phone cameras. What does all this mean, for those of us involved in Marketing and Social Media? Images are compelling: Our eyes can certainly “read” images faster than text; our eyes are drawn to images. Photos can trigger emotional responses. A picture is worth a thousand words. Social media strategists even know which colors our eye prefer–a recent study of Instagram photos revealed that blue-tinged images receive 24% more “likes” than red-hued images. Feedback from social media images is valuable: Major companies, including retailer Nordstrom, are adapting their marketing campaigns based upon direct feedback from images on social media including the number of “likes” or “pins” garnered by photos of new fashions. Nike is even designing custom shoes based upon fans’ Instagram photos. Images need to be put into context: What are we losing as we shift (from text to visuals)? Answer: Context. Images, although powerful and emotional, can be taken out of context. When we post images, it’s up to us to provide an accompanying message. It doesn’t mean we don’t read anymore. Yes, images are the driving force of social media. On Facebook, more people engage with photos than text posted alone. The entire concept of Pinterest is based upon the pinning of images. But “combining text and visuals is much more effective,” according to Will Palley, Trends Strategist for Marketing Communications giant JWT. The length of text shared via social media depends on the time of day. During the workday, brief is better. But on weeknights or weekends, when people are relaxed and have a bit more time, successful communications can include more details. We still love a great story. Storytelling is still a “very deeply basic human interaction,” shared Ji Lee, Creative Director for Facebook. It’s just that more and more of our stories shared via social media begin with a compelling image. And that’s changing the dynamics of news-gathering organizations everywhere. “One of the biggest challenges to journalists today is adapting storytelling techniques to a visual standpoint,” explained Jim Roberts of Mashable. Journalists need to tell stories that grow out of a great visual. Social Media Week, February 17-21, featured more than 800 events in eight cities, drawing more than 25,000 attendees total. Given the topic, I have to include one more visual! – Social Media Week NYC took place at Highline Stages, 15th Street. Welcome to “Gettysburg Social!” This column examines the latest social media trends, while highlighting Gettysburg and Adams County businesses. This article was first published in Celebrate Gettysburg magazine, Jan/Feb 2014. Every second, two new members join LinkedIn, the social media network with a professional twist. LinkedIn is 10 years old, and while it has a solid foundation, it’s still growing and adding new features that make it easier to “do business” via social media. Adams County’s professionals are well-represented on LinkedIn; if you enter the search term “Gettysburg,” more than 16,000 profiles pop up. One reason is that many Gettysburg College students have LinkedIn profiles. Actually, students and recent graduates are LinkedIn’s fastest-growing demographic. As of the school year ending May 2012, more than 20 million students and recent grads have developed “online résumés”—another way to approach LinkedIn profiles. But LinkedIn profiles aren’t limited to those launching their careers; well-established professionals from all job sectors imaginable are represented, including executives from all of 2012’s Fortune 500 companies. There are 225 million LinkedIn users worldwide. Creating a profile allows you to… connect to past and present co-workers, ask for their recommendations, list your skills and accomplishments, promote your job search, or scan online employment postings. It’s online networking at its best. Simply click on the links above to explore the LinkedIn company pages. And if you haven’t already, consider creating a company page to showcase your business today! Overview: Learn about valuable–but free–social media channels and select the “best fits” for your business. I can attest to this personally, having taught several rounds of “The Art of Social Media,” a “social media 101” series through a local arts council. The majority of my class attendees are those in the 55+ category, although there have consistently been a smattering of younger and middle-age attendees as well. It’s always interesting to hear attendees’ motivation for signing up for the workshops, a four-week series totaling eight hours of instruction on Facebook, Twitter, LinkedIn, Pinterest and other forms of social media. The most consistent answer I receive is, “I’ve been resistant to social media–I thought it was a fad–but now that I realize it’s here to stay, I want to learn it.” That answer comes from people of all ages! 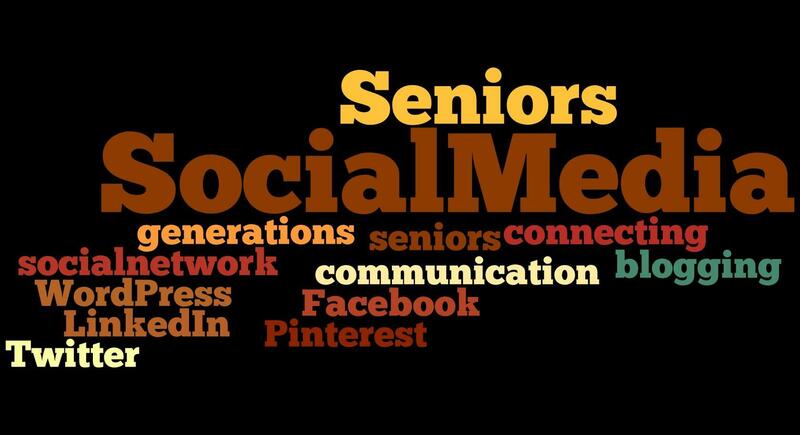 But the most common response from older attendees is “I want to communicate with my grandchildren and connect with them on Facebook (or Twitter).” And it’s so thrilling to hear their success stories, as they begin connecting with their grandchildren, sharing photos and communicating via new methods! If you’d like to join in the next session of The Art of Social Media, offered Wednesday evenings in September at the Adams County Arts Council, Gettysburg, PA, click here for online registration or call the arts council at 717-334-5006. If your September calendar is already busy, please note the 4-week session is being offered on Wednesday evenings in October as well. To read more from the August 5, 2013 Pew Research report on social media use, click here.